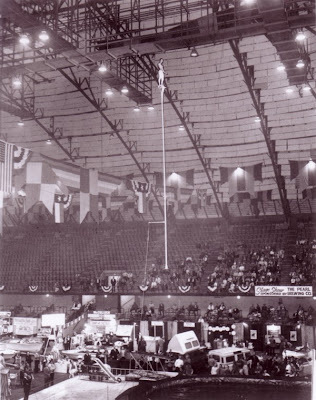 I saw a lot of riggings hung in my 50 years, even nets, but I have to admit my ignorance here, this is the first time I ever saw anyone hang a sway-pole,(except break-away poles). Maybe someone out there can give me the details. 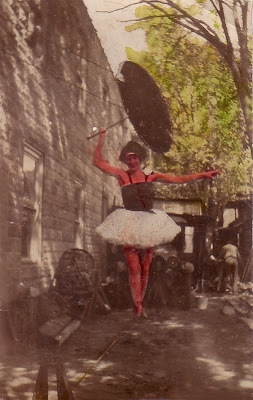 RECEIVED THIS FROM PENNY: OFF "CIRCUS VERN". Some of you have probably seen it already, for those who have or have not. 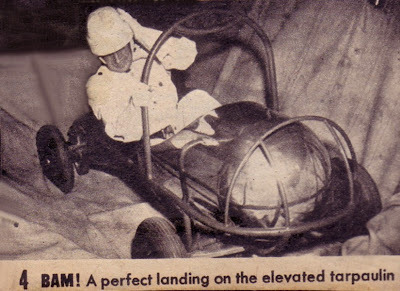 let's all wish Jim, "GOOD LUCK, & A SWIFT RECOVERY"
A CLOSE UP VIEW OF THE ROCKET CAR. WILL HE MAKE IT???? NOW HERE'S ANOTHER ONE I DID GET HERE TOO LATE TO SEE! When they talk about great Cradle Acts here's a name that always comes up. 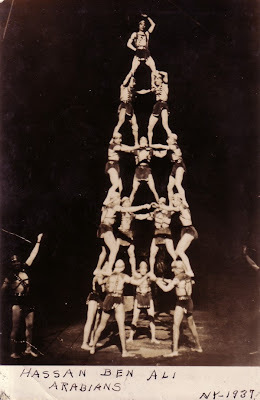 I really wanted to include this act in my original post about "High Acts", but couldn't find a picture anywhere. "All things come to he who waits"! QUASSAR'S QUIZ #2: CAN ANYONE NAME THESE HAPPY NEWLY-WEDS???? I don't usually run two quizzes in a row, but when I found this picture from the New York Herald Tribune, dated April 10, 1946, I couldn't resist. 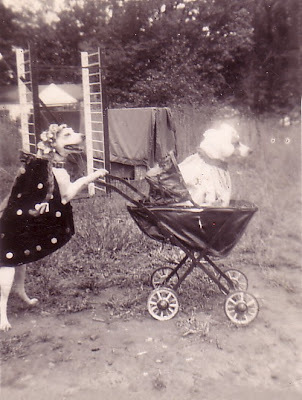 It was taken the day after their wedding. We all knew them well,,,, and loved them dearly! 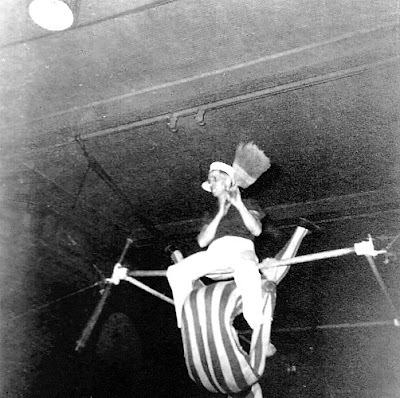 Now I didn't say this was the last Aerial Bar Act, The Ibarras, & The Rodriguez were two of the greatest, & there have been some very good ones come out of Eastern Europe. 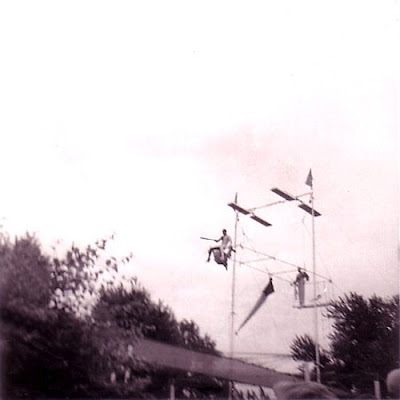 The Aerial Bar Acts of days gone by were not the same, the emphasis was more on Comedy, the music was a "gallop",(ours was "Happy Days Are Here Again"), played loud & fast, & the act was done the same way, non-stop action, when one guy finished a routine there was already another on the first bar starting the next. 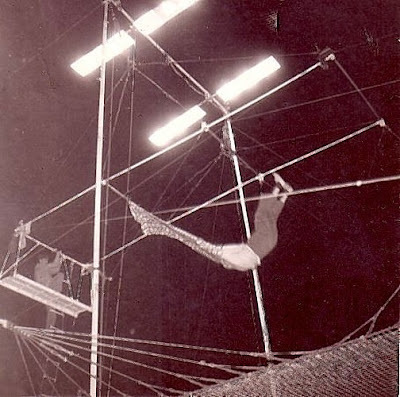 The net was stretched tight like a trampoline to enable the performers to go from the bars to the net & "rebound" back up to the bars, & every routine was finished with a series of somersaults in the net. 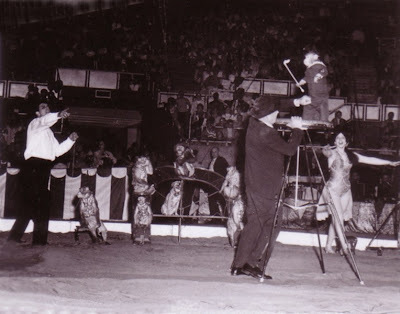 Because of the fast routine & comedy they were almost always used to open the show, some of the big shows having as many as three bar acts in a display. I once heard Orrin Davenport say it was the best opening act in the business. 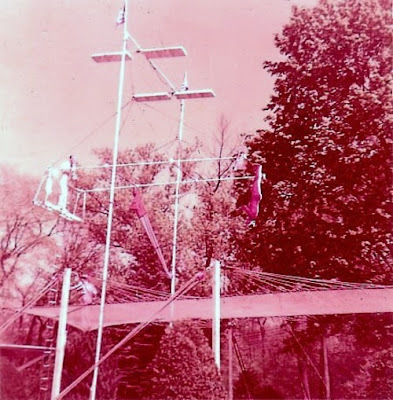 Idlewilde Park Pennsylvania, 1956,(Photo enhanced by Jerry Beeman)! 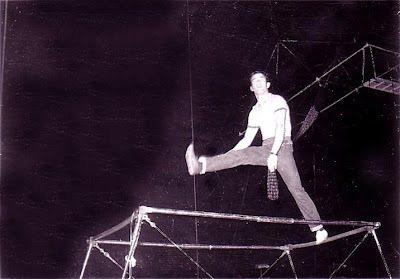 "STRIP SHIRT" or "LONG SHIRT"
This was probably the opening trick of every Comedy Aerial Bar Act that ever worked. 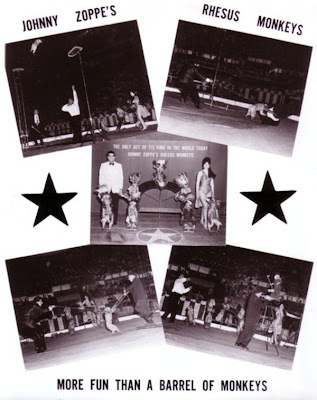 Each one of us did three routines, this being Bruce,s opening & of course each routine finished with a somersault to the net, & a series of somersaults in the net. 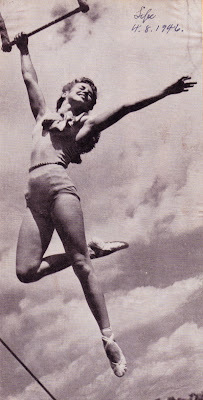 Most routines were done starting from the pedastal, then from the first bar, to the second, third, back to the second & then to the third bar again. 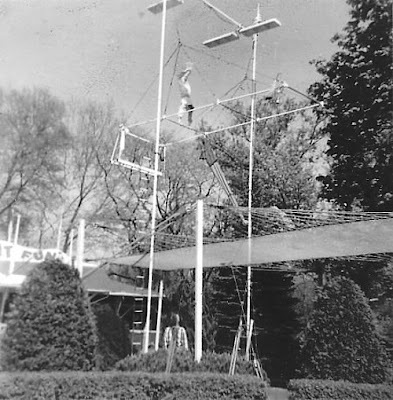 On my second routine, when I returned to the second bar I would jump to the net & bounce back up to the third bar, do a toe hang & a head first dive to the net. 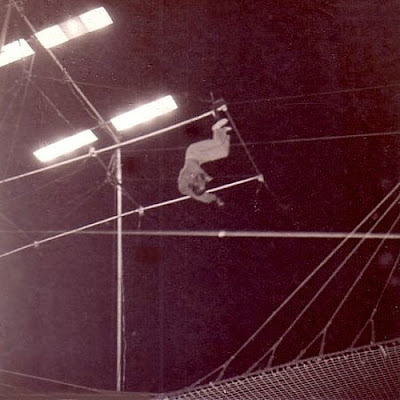 This is Bruce finishing a routine with a dive over the last bar, catching with a reverse grip. 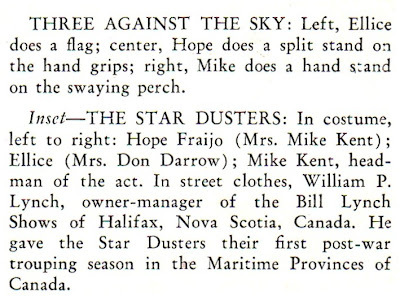 Now there is one for you historians to look up, where did the name for this routine come from? I'm not even sure if I'm spelling it right. 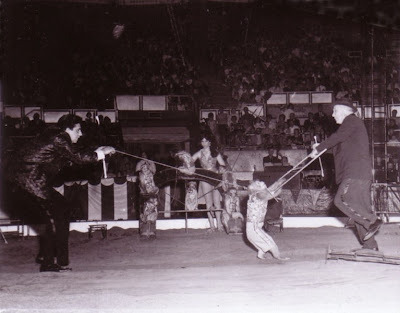 In our case Blondie would do a routine of tricks & end up sitting on the last bar, I would then go to the middle bar, drop to the net & rebound up grabbing him by one foot & at the same time swinging my foot up for him to grab, we would then lock arms & legs and revolve around the bar with him winding up on top. 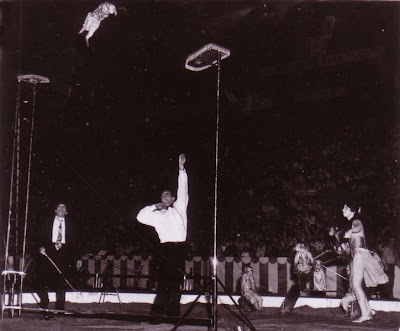 After a couple sweeps &swats with a broom full of shredded paper, we would revolve again putting me on top, I would then hit him on the kiester with the slapstick and he woukld fall to the net. 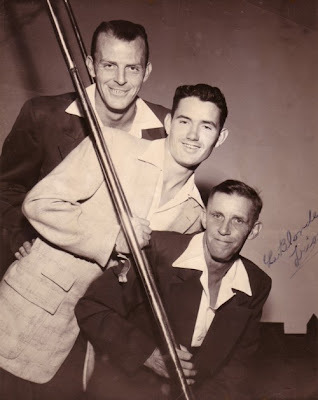 The prop used by the second comedian varied from an old fashioned double board slapstick to an imitation mallet, in our case it was a baseball bat, all of which were loaded with a 38 caliber blank cartridge. 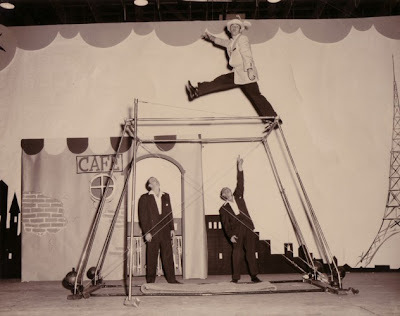 The only problem here would be if the guy on the top turned the prop the wrong side down, & it was known to happen. 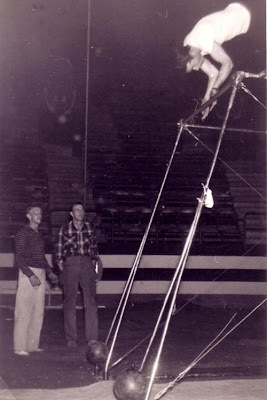 Bruce is just getting ready to do a "fly-over", as he swings under this bar he will let go, and fly feet first over the next bar, doing a half twist catching the bar as he goes past it. 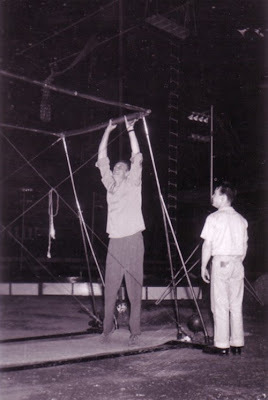 On the off season we still had to eat, so we would get the portable rigging out, & work Jimmy Hetzer's Christmas dates, or head North to Canada where there were still some Night Clubs, & Theaters using Novelty Acts. 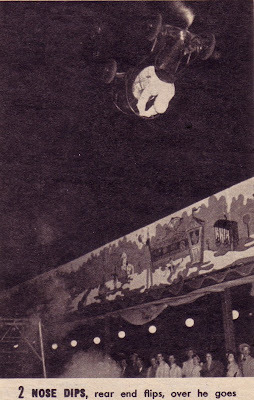 Montreal was wide open in the '50's, with some clubs that stayed open all night long, I can remember loading out of The Mocambo Cafe at 6:am, & there were more entertainers coming in. 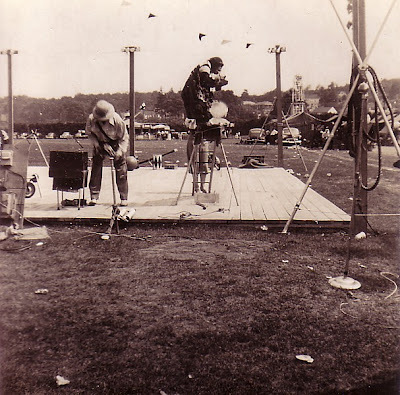 It was a Paradise for small acts, like Jugglers & Unicycle Acts because they could work almost anywhere, as I remember it The Cycling Kirks stayed in Montreal the whole Winter & worked all the time. 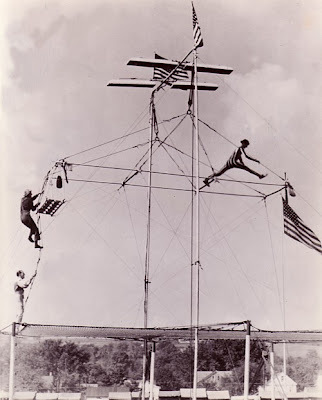 We had some friends that did a Ground Bar Act, & one time sort of "kidding on the square", they said we should make a deal, we wouldn't do ground bars & they wouldn't do aerial bars, so Blondie told them it was okay with him if they wanted to do aerial bars. 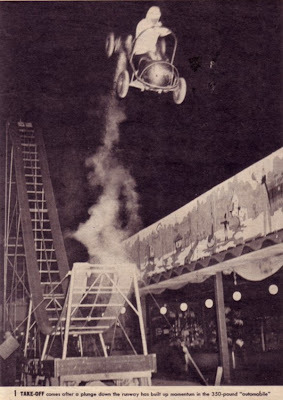 This was not a hard trick, but could be a treacherous one to miss. 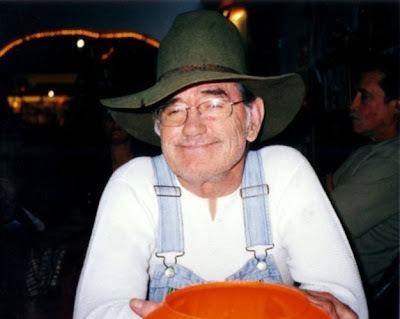 George Hubler did the trick in the act, we did,(Glen Martin & Co.), me being "Co.", he missed the trick but it turned him just enough to land on his heels, severely brusing them. 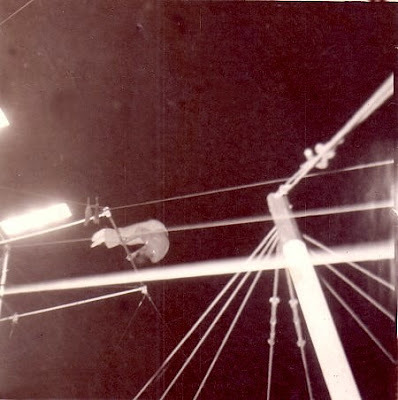 You can see here what I was saying about Bruce's height, it was even more of a problem on this rigging, as he had to keep from hitting the other bar with his feet & also the ground, plus these bars were only 4 ft. long so he had to keep from hitting the sides when he bent his legs. Once in while you see a performer playing a part in the ring who absolutely fits the part, in my eyes Johnny Laddie was one of those performers. 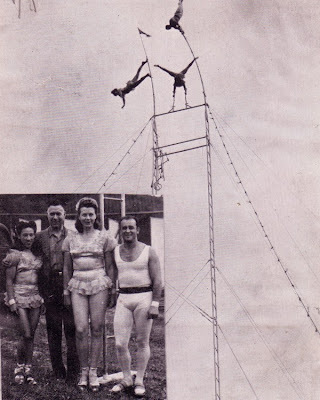 I found the above composite of the Johnny Zoppe's Rhesus Monkeys when it was presented by David, his sister Sonja, with his father doing the comedy. 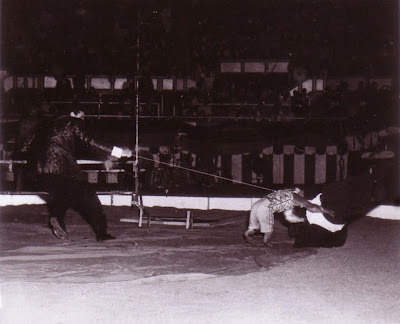 To me it was & even though Johnny is gone, still is one of the "Classic" Animal Acts of all times. As we all know, this act, along with Susan Sheryll's Royal Afghan Champions, is still being presented by David Zoppe & his lovely wife Susan. 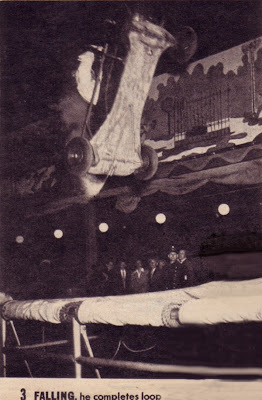 In a recent post about entrance capes & wardrobe I included a lovely young Aerialist who was not familiar to me, but made a very nice appearance, no overkill as you see so much of these days. Below is an email I received from her,showing her appreciation, I think it was very thoughtful of her to take the time, & also give a little information about her career. 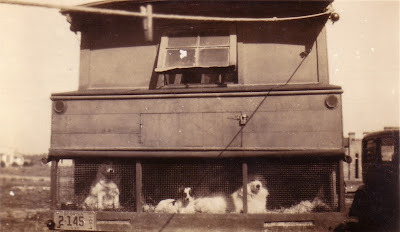 and you have all these wonderful photos on your blog. with you to clear up who the mystery girl is. 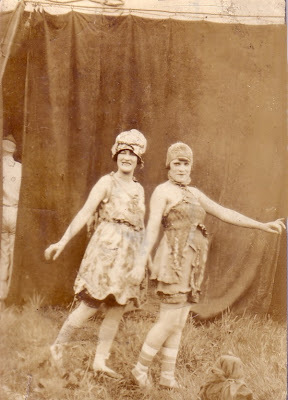 still on the Ringling show as a publicity photo. 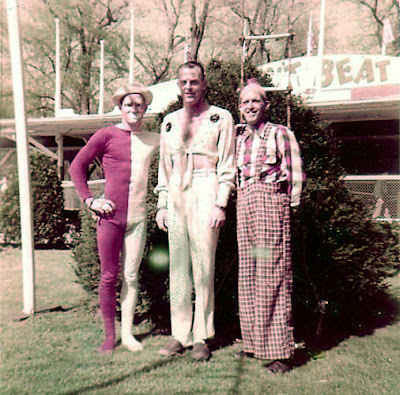 Phils Bros, Leibel Circus, Hamid Morton, and probably a few others. by Jacqueline Marie Marsolais from there on. 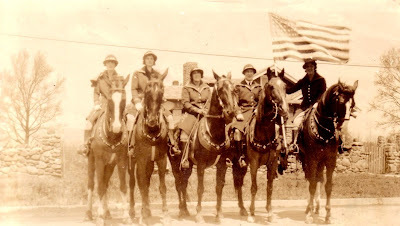 with Carla Zoppe in her all girl riding act. After a few years doing the lyre, I switched to single trap. graphic design and printing business and live in Fort Lauderdale, Fla. Thanks again for the photos and the memories. It's been really nice. John Herriott was recently quoted on Buckles Blog, "It's all been done before", well maybe not "all" of it, but you can bet, a lot of it. How many times have you heard someone claim to be the first, the original, the only. 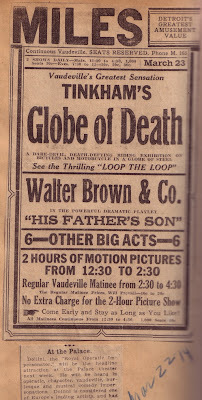 Here is a vaudeville newspaper ad for Detroit's Miles Theatre, in case you can't read the hand written date, it is March 22, 1914. 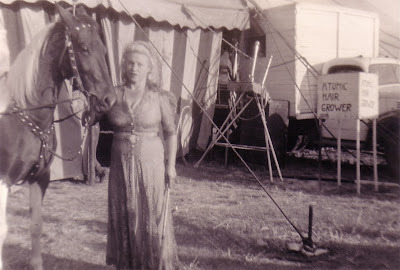 Some other notable acts to appear at the Miles, Rhoda Royal's Circus,,John Robinson's 4 Singing & Dancing Elephants,,HOUDINI,,Albers 10 Polar Bears,, & The Riding Duttons. 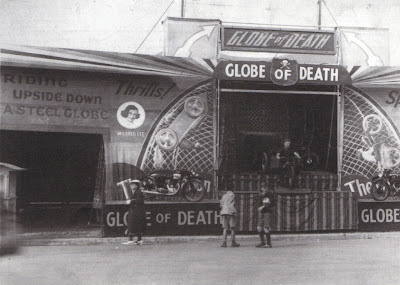 Hi, here are a couple of Globe of Death pictures. 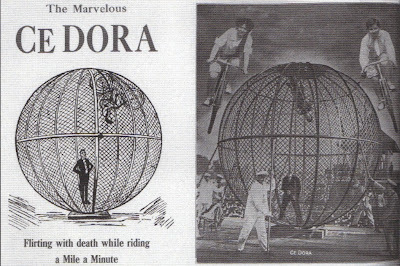 The Marvelous Ce Dora. I don't know much about them but they are on bicycles! 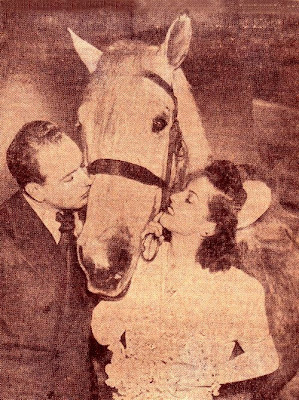 Mildred and Bob Lee. 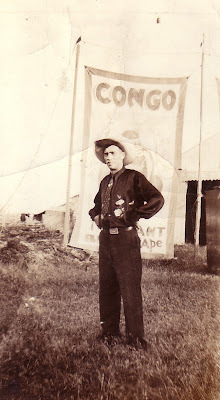 Toured with the Conklin Shows in the late 40's. 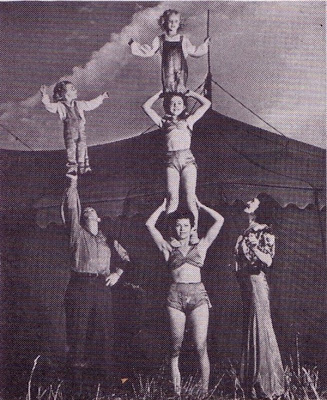 Can anyone identify this well known family, you see some of them at "Showfolks" quite often???? THE ANSWER IS!!!! THE DeRIZKIE FAMILY! The picture is from the Dec. 1944 White Tops. Counting the arm on the right side, it is 16 men. 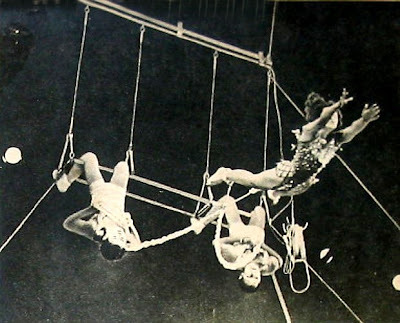 I was told as a "First of May", that I came into the Circus too late, I don't think so because I saw & worked with a lot of great people with great acts. In this case it is true, I wish I could have seen this one. 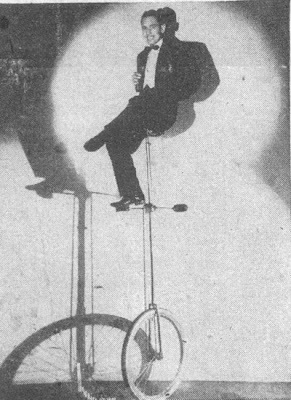 Described as "The Greatest Unicyclist Of All", who is he???? Trudy says I have to put "something", on the blog so the following are a bunch of them, not neccessarily connected, just a "little bit of this, & a little bit of that". Tiny Gallagher has been popping up a bit lately so here she is again. 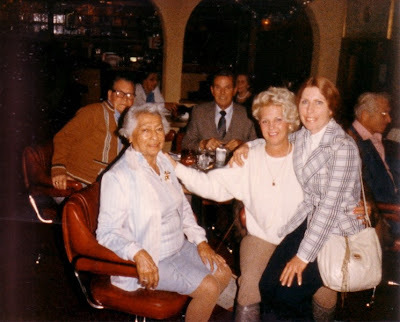 This is Showfolks in the '80's, on the left is Teresa Morales, & on the right is Trudy Strong. Seen in the background are Bobby Hakes, & Buzzy Cuttin. Look at the field, I never saw such a mess!!!! I guess the 4 pc. is with two pair of pants. Gotta be a joke there somewhere! A notation on the back, probably by Connie,"This is my Uncle Fred"
WHEN GRANDMA WAS A GIRL. 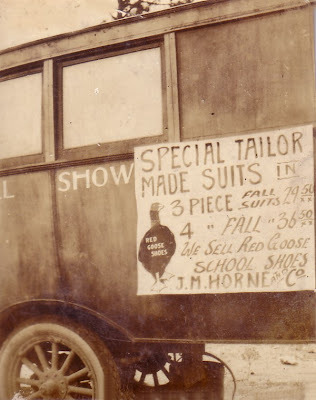 Don't laugh, that wardrobe was probably quite the thing then! 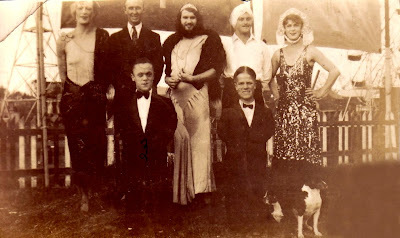 The Bearded Lady is identified on back as, Fanny Funk, The man in the Turban as Hoppy, & the little guy on the left as, Manny Midge. Wadda ya wanna bet the band is playing "Walking My Baby Back Home"? They don't care where they're going, they just want to see where they've been. License plate reads, Georgia 1934.